Are you looking to add that extra wow factor to your special day, then you have come to the right place. 'The Old Girl' and 'The Old Boy' offer that touch of nostalgia and make a wonderful talking point, not to mention the amazing photo opportunities! Turn up to your wedding location in style, take your wedding guests to the recpetion in style - keep everybody together - don't lose anybody. 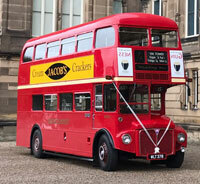 Our vintage buses are restored to the highest standard inside and out. We at Weardale Motor Services pride ourselves in being able to offer a 1st class service on such a special occasion, helping to add all those extra touches to your big day. 'The Old Girl' first graced the roads in 1949 after being purchased by us at Weardale as a brand new single deck bus. In 1958 she gained her status as a double decker after gaining the top deck. She is now a very beautiful fully restored Leyland Double Decker that seats 65 passengers and does a leisurely speed of 35mph. 'The Old Boy' is our latest addition and is a very handsome 1960 London Routemaster, once seen on the roads of our Capital City. He has original signage and destination board. 'The Old Boy' seats 64 passengers and does a sprightly speed of 40mph. 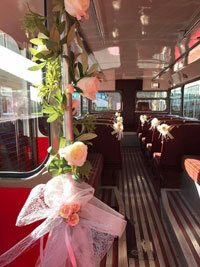 Both vintage buses come decorated with cream flowers and ribbons but we can also add little touches to match the theme of your special day if you wish. We cover a wide area within the North East (very slowly), whether it be transport of the Bride & Bridesmaids, the groom and his party, the guests or the entire wedding (please allow plenty of time for the the Old Girl to get there!). Contact us to discuss your options, check availability or even just to make an appointment to view our beautiful vintage buses, you won't be disappointed.